Riverdale, Gotham, Lucifer, and Time After Time are joined by two Warner Bros. animated series at WonderCon 2017. Warner Bros. has announced their panels for this year’s WonderCon convention which is back in Anaheim, CA for this year’s event from March 31-April 2. Riverdale, Time After Time, Gotham, Lucifer, Teen Titans Go! and Justice League Action will all be there. Below, find the press release with more details. BURBANK, Calif. (March 15, 2017) — Warner Bros. Television brings its heroes, villains, time travelers and mysterious teens together under one roof during WonderCon 2017, with four series attending the fan fest in Anaheim March 31–April 2. Panels and Q&A sessions with Riverdale (Thursdays 9/8c The CW) and Time After Time (Sundays 9/8c ABC) take place on Friday, March 31. Fans will be treated to an exclusive screening of a brand new episode of Riverdale on Saturday, April 1. Closing out the weekend with Sunday, April 2, sessions will be Lucifer (new episodes return May 1, Mondays 9/8c FOX) and Gotham (new episodes return April 24, Mondays 8/7 FOX), along with Warner Bros. Animation’s hit DC Super Hero series Teen Titans Go! (Fridays 6/5c Cartoon Network) and Justice League Action (Saturdays 7:30 a.m./6:30 a.m. Cartoon Network). 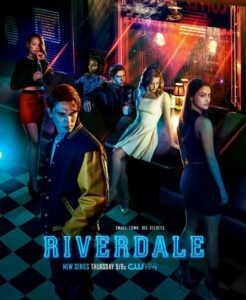 Riverdale stars KJ Apa, Lili Reinhart, Camila Mendes, Cole Sprouse, Marisol Nichols, Ashleigh Murray, Mädchen Amick and Luke Perry, along with executive producers Roberto Aguirre-Sacasa, Sarah Schechter and Jon Goldwater. Time After Time stars Josh Bowman, Genesis Rodriguez and Nicole Ari Parker, along with executive producer Marcos Siega. Lucifer stars Tom Ellis, Lauren German and DB Woodside, along with executive producers Joe Henderson and Ildy Modrovich. Teen Titans Go! producers Michael Jelenic, Aaron Horvath and Peter Michail, along with voice actor Greg Cipes. Justice League Action producers Jim Krieg and Butch Lukic, along with voice cast P.J. Byrne, Rachel Kimsey and Jason J. Lewis. Gotham stars to be announced. The cast and producers of all series will be signing autographs, and tickets will be distributed in Exhibit Hall D of the Anaheim Convention Center on the morning of each session. Following are the WBTV panel dates and times for WonderCon 2017 (panelists and panel times may be subject to change).